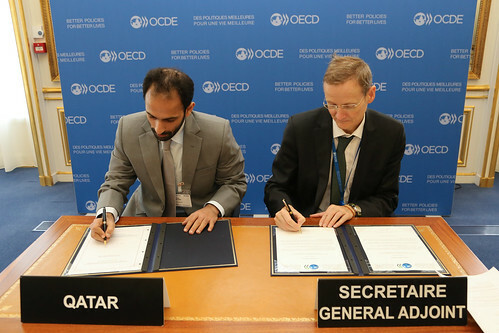 04/12/2018 – Today, Qatar signed the Multilateral Convention to Implement Tax Treaty Related Measures to Prevent Base Erosion and Profit Shifting (the Convention), becoming the 85th jurisdiction to join the Convention, which now covers nearly 1 500 bilateral tax treaties. The Convention is the first multilateral treaty of its kind, allowing jurisdictions to integrate results from the OECD/G20 BEPS Project into their existing networks of bilateral tax treaties. The OECD/G20 BEPS Project delivers solutions for governments to close the gaps in existing international rules that allow corporate profits to “disappear” or be artificially shifted to low or no tax environments, where companies have little or no economic activity. Treaty shopping, in particular, is estimated to reduce the effective withholding tax rate by more than 5 percentage points from nearly 8% to 3%, generating large revenue losses for developed and developing countries alike. The Convention will become effective on 1 January 2019 for the first 47 tax treaties concluded among the 15 jurisdictions that have already deposited their acceptance or ratification instrument. The Convention, negotiated by more than 100 countries and jurisdictions under a mandate from the G20 Finance Ministers and Central Bank Governors, is one of the most prominent results of the OECD/G20 BEPS project. It is the world’s leading instrument for updating bilateral tax treaties and reducing opportunities for tax avoidance by multinational enterprises. Measures included in the Convention address hybrid mismatch arrangements, treaty abuse, and strategies to avoid the creation of a “permanent establishment”. The Convention also enhances the dispute resolution mechanism, especially through the addition of an optional provision on mandatory binding arbitration, which has been taken up by 28 jurisdictions.